Hungarian Prime Minister Ferenc Gyurcsany has sharply criticised several European Union governments over Croatia's stalled bid to join the EU. His criticism was targeted at the governments of the UK, France, Germany and the Netherlands. Croatia's bid has been hit by a row over its alleged failure to co-operate fully with the international war crimes tribunal in The Hague. Hungary wanted Croatia's EU accession talks to start on schedule in March. "Some diplomats came to us saying that these sort of governments would not be happy if we support Croatia," Mr Gyurcsany said. He described the case against Croatia as rumours and allegations not supported by any evidence. 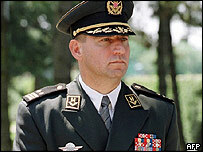 Information from western intelligence agencies was passed to the Hungarian government on the case of the fugitive Croatian general, Ante Gotovina, to support the argument that Croatia was not co-operating fully on war crimes issues. In response to Mr Gyurcsany's comments, one western diplomatic source told the BBC that a number of countries had shared information with the Hungarian government. The fact that the Hungarians chose not to accept those views and those of The Hague tribunal, backed by the UN Security Council, had caused considerable surprise, the source said. Hungary joined the EU in May last year with nine other countries - mainly ex-Soviet bloc states. Its support for Croatia was shared at an EU level by a minority of countries, including Austria and Slovenia. What appears to have upset the British and others is that the Hungarian prime minister chose to believe the Croatian position rather than that adopted by the UN Security Council and the EU. In the long run, this dispute and another over the speed at which Ukraine can join the EU could affect Hungary's chances of taking part in western projects to rebuild the Balkans.